LONDON, Feb. 7, 2019 /PRNewswire/ -- International Game Technology PLC ("IGT") (NYSE: IGT) announced that it won the Lottery Product of the Year for its GameTouch™ 20 self-service lottery vending machine at the 12th Annual International Gaming Awards in London. The International Gaming Awards recognize excellence and innovation for technology, products, and services that enhance the gaming experience. A panel of international gaming industry experts judged the awards. "To drive growth and reach a new generation of players, the expansion of retailer networks remains a priority for lottery operators. 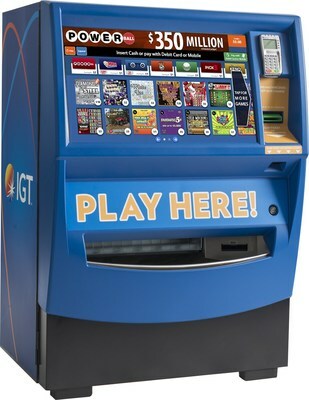 The GameTouch 20 was built to meet the unique size requirements to deploy self-service lottery to big-box retailers, a new category for many lotteries,"said Renato Ascoli, IGT CEO of North America. "This product was optimized for user experience and sales effectiveness based on extensive IGT research and player testing. We are honored that IGT has been recognized for innovation with the Lottery Product of the Year award for the second year in a row." The GameTouch 20 was created based on focus-group testing and features an intuitive interface and a landscape-oriented screen tilted at an angle to ensure a natural and easy user experience for players. Standing at 54 inches tall, the cashless-enabled, touchscreen vending machine provides 20 bins for instant tickets, the greatest number of ticket bins currently available in this format. The product also sells draw-based games. The first GameTouch 20 machine went live in North Carolina in November 2018, and IGT will roll out more than 1,500 machines in at least 10 states by the end of 2019. The award was presented to IGT at a ceremony held in conjunction with ICE London. The International Gaming Award for the best lottery product goes to the company that has shown the best in practices over the last 12 months; demonstrated their offering to be innovative and engaging to customers; and delivered a range of lottery games and approaches with the best options for play.